Spend Skill Points to learn skills. The latest issue of Weekly Jump reveals a new “Skill Panel” system for Dragon Quest XI: In Search of Departed Time. 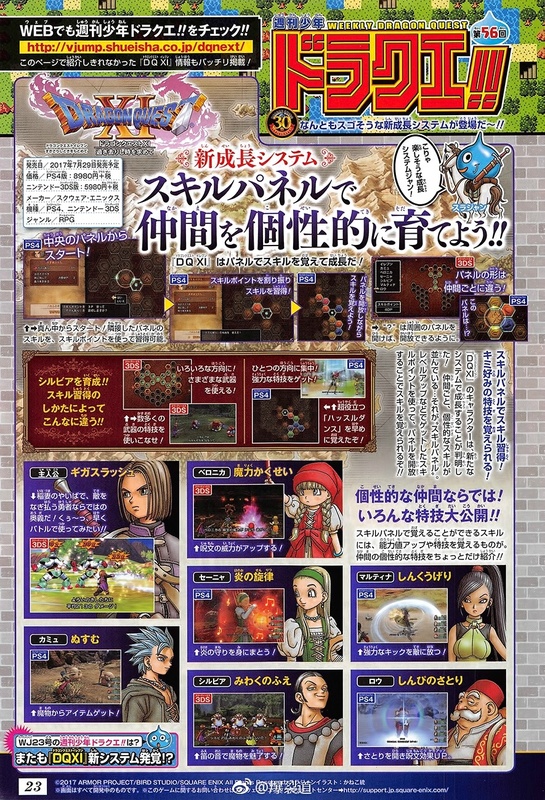 The Skill Panel is a new system by which the characters of Dragon Quest XI can grow. The Skill Panel is lined up with unique skills for each character. By using “Skill Points,” which are acquired through methods such as leveling up, and unlocking panels, you can learn new skills. You’ll start from the middle of the Skill Panel and can use skill points to learn skills while unlocking adjacent panels. There are also “?” panels that will be unlocked by opening surrounding panels. The shape of the Skill Panel is different for each character. Protagonist: “Giga Slash” – Mow down the enemy using a lightning blade in a skill exclusive to a hero. Camus: “Steal” – Get items from monsters. Veronica: “Magical Awakening” – Increases the power of spells. Senya: “Melody of Fire” – Puts on a flame of protection. Silvia: “Flute of Fascination” – Charms monsters with the sound of a flute. Martina: “Vacuum Kick” – Hits the enemy with a powerful kick. Row: “Aesthetic Enlightenment” – Attains enlightenment and increases spell effects. While the Skill Panel was introduced in the latest issue of Weekly Jump, another new system will be introduced in the next issue. Dragon Quest XI: In Search of Departed Time will launch for PlayStation 4 and 3DS on July 29 in Japan. A Switch version is also planned, but has yet to be shown or dated. If you missed it, catch the latest trailers and gameplay footage here.